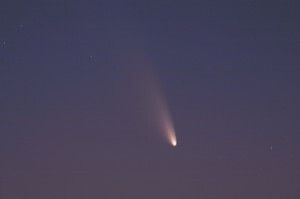 I was able to catch a good glimpse of comet PanSTARRS (C/2011 L4) again this evening (March 13th). Fortunately, it was a bit warmer, the wind was lighter and the sky was just a tad clearer. The viewing didn't give quite the same level of awe as the comet being near the moon. However, I still managed to get some post worthy pictures of it. Again, the comet was NOT visible to the naked eye from where I was viewing even with a reasonably clear sky. It was not dark at the time so in a very dark location it just might be visible but even in that scenario, the comet is extremely small in the night sky so will probably only show up as a fuzzy pin-prick in the fabric of it all. On March 14th, if you're up for it with binoculars or a telescope (or decent camera) you should be able to catch it around 10 degrees above the horizon almost due West for the next several nights. Please see my former posts for details and charts of roughly where it will be located. This is an update for Comet PanSTARRS (C/2011 L4) for March 13th 2013. The reason it's for the 13th is because observational opportunities have run their course (except for possibly Hawaii and Alaska). 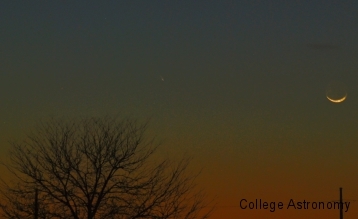 So, tonight, March 12th we were able to see the comet in the low western sky. However. The comet was 'not' as bright or as large as I was anticipating. 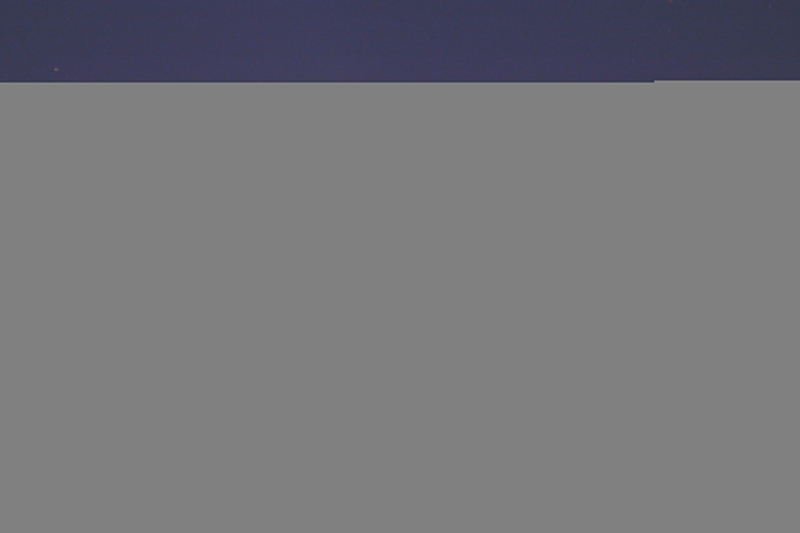 Unfortunately it did require a telescope to view and a bit of guess work with the camera to get some exposures of it. Fortunately, that work did pay of with a few decent shots (for nothing but a Nikon D80, tripod and 70-300mm lens). Please have a look in the gallery for more images from the 12th. This is the comet C/2011 L4 PanSTARRS path through the Western night sky during the month of March. The good news is that tonight we were able to view the comet for almost 45 minutes and I would expect that timeframe to only increase as it gets further from the Sun. 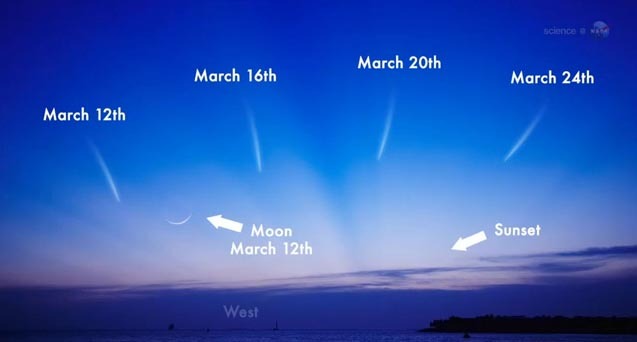 As for viewing the comet on March 13th through March 26th, I've included a path diagram below for easy identification. Based on viewing tonight, you will probably need a set of binoculars or a very clear sky since the comet is somewhat dim. However, you should still give this a shot since this comet only comes around once every 100 million years, this is literally a once in a million lifetime chance! Feel free to check back for more information and pictures. We'll be posting more as we take them! We've had a few comets come through here and there over the past few years without much hype. While this will not be as spectacular as Hale-Bopp or Hyakutake back in the late 90's, this month's comet PanStarrs (Designation C/2011 L4 PANSTARRS) will still provide a spectacle in the evening skies (weather and view permitting). 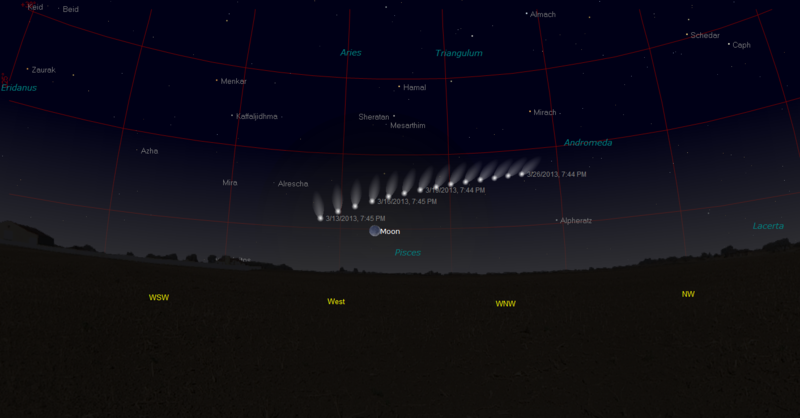 The comet visits the Northern Hemisphere and be visible to the West in the evening skies starting this week. You'll need good viewing conditions to the West and an unobstructed view, I would suggest a high point looking west as your best chance sine this comet will be fairly close to the horizon. The most important aspect of this comet for the average person is that this comet will be visible to the naked eye which means you won't need to have binocolars or a telescope to view it. However, for best viewing observing equipment such as a telescope or binoculars are certainly encouraged. You might check your local astronomy organizations for possible viewing opportunities and star parties related to the comet. If you're unsure of organizations around you, an excellent resource for this is the Astronomical League as they keep track of most (but not all, so try Google if you don't find one) amatuer astronomy organizations and can provide links to their sites. Now, back to the comet. Based on it's name we can see that it was discovered in 2011 by the Panoramic Survey Telescope and Rapid Response System which sits near the top of the Haleakala volcano in Hawaii. Until recently, the comet has been visible primarily in the Souther Hemisphere but as it rounds the Sun, that will change, giving way to our viewing pleasure in the Northern Hemisphere. The chart here shows you rough positioning of the comet as it makes it's way through the sky. This image is courtesy of NASA. The comet reaches it's closest approah to the Sun on March 10th and the expected return to visibility is March 12th. However, with luck and assistance you may be able to pick it up on March 11th. One important viewing tid bit for this comet is that you do need to pay close attention to your viewing time. Because this comet is low in the Western sky it presents a time problem, too early and the sun will still be up and if you try later it will be either obstructed by trees, hills, atospheric distortion or the lot of it. Assuming you have low pollution and reasonably good weather, you can probably start looking at about 15 minutes past sunset. For Lawrence, KS on March 11th this would be roughly at 7:40 PM local time. To spot it you'll want to look around 8 degrees South of West and around 10 degrees above the horizon. The easy way to do this is to remember that outstreched your fist is roughly 10 degrees plam horizontal and 5 degrees palm verticle. So this would mean, it would be a little more than 1 fist width verticle to the left of where the Sun set and around 1 fist with horizontal above the 0 point of the horizon. Over the course of the next several weeks the comet will be travelling from South to North along the Western horizon and getting further away from the Sun so the observing times will increase. However, this is a tradeoff since the further away from the Sun the comet gets the less of a tail it will exhibit and the dimmer it will get. That's part of the reason why this upcoming week beginning March 11th will present the best time to view. Comet visibility will be best this week and will taper off through the end of the month of March when it will once again become difficult to detect even with optical aides like binoculars or telescopes. Don't wait to see it! There are a few points of interest over the next week for those viewing the comet. I'm going to detail them out and provide pictures below. 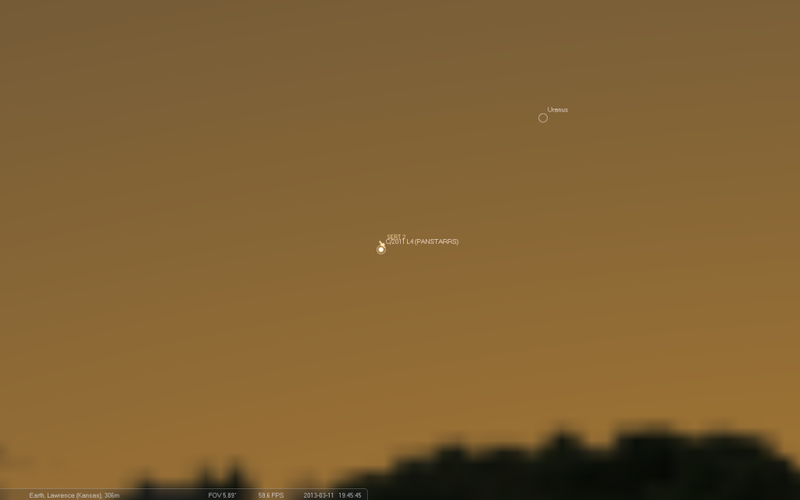 All pictures made with Stellarium. March 11th 2013 19:45:45 – Lawrence, KS – Comet C/2011 L4 PANSTARRS and satellite SERT 2 pass within 3 angular minutes of one another. This event will happen very fast and may not be visible due to sunlight, the comet was closest to the Sun just one day ago. If you are seconds early or late you will not see this as the SERT 2 satellite crosses the entire sky in only seconds.  This will happen again over the course of the next several weeks as well as with a few other satellites (all from Lawrence), METEOR-PRIRODA, NOAA 15, SL-6 R/B(2), COSMOS 1500, COSMOS 2242, AJISAI (EGS) to cite a few. Additionally, it should be noted that most of these kinds of sightings will be very subjective to your geographical location and may not be visible from where you're at. You might have better visibility for other satellites posing for photo ops with the comet because of that. 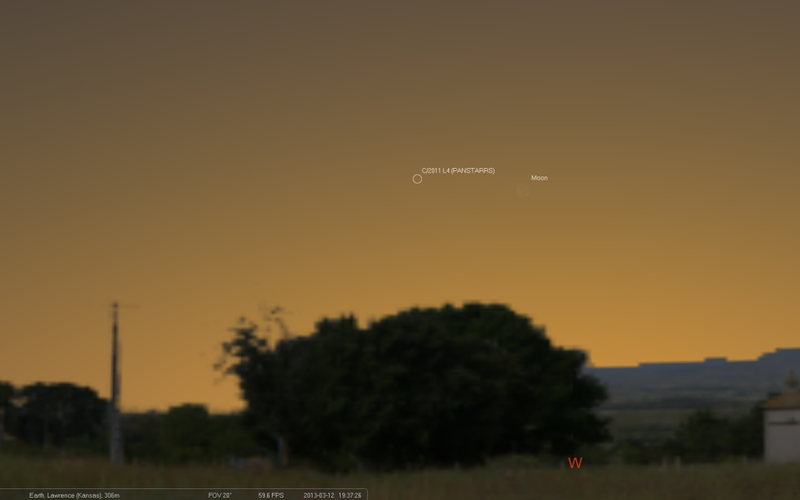 Since these sightings will be brief and require precision, I suggest that you either download Stellarium or find other resources to help you plan your observation. March 12th 2013 All Visible Time – Everywhere – Comet C/2011 L4 PANSTARRS and the New Moon will be close enough to make for some interesting photo ops as they will be less than 5 degrees apart. Depending on how things play out, you may also find some good shots with Mars on the lower horizon as well since it is on it's move into the evening sky as well but with the comet moving away from it, these chances are subjective at best.